Leave a comment on THIS post through Tuesday, September 5, 2017 to be entered in the DRAWING for a copy of the book below. If you mention in your comment that you’re a follower (see in the left sidebar “Join This Site” and “Follow by Email”), I'll add your name a second time in the drawing. U.S. mailing address required to receive a paper book. I may or may not have read books offered for giveaways. The mention and giveaway of books on my blog does not in any way indicate any manner of my endorsement of said books. Read book giveaway details at Disclaimers. To provide you security, please leave your email address like this: johnATyahooDOTcom. Winner announced in next Thursday's blog post. influence. She has published 200 articles, devotionals, and essays in more than fifty magazines and contributed to several anthologies. 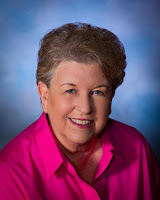 Vickie is the author of the novels, Postmark From the Past, Moved, Left No Address, and Waiting for Joy, and a devotional book, Psalms for the Common Man. Vickie is coauthor with Jo Huddleston of the gift book, Simply Christmas, and Writing 101: A Handbook of Tips & Encouragement for Writers. Welcome, Vickie. Please tell us a little about your novel, Wheels of Justice. Buford bounded out of his office and headed straight for me. I braced myself for another verbal tirade. Buford stood so close to me, I could smell his breath, and it did nothing to help my queasy stomach. He needed some mouthwash big time. I turned my head just a little to get away from the overpowering scent. It was the wrong thing to do. He grabbed my chin and forced my face toward him. He squeezed my jaws so hard, tears filled my eyes. The pain radiated across my cheeks. I tried to pull away from him, but Buford just squeezed harder and laughed—a sound that made my blood run cold. All the warnings I’d heard about him flashed through my mind again. “I’d fire you today, but Monica would give me all kinds of grief.” He squeezed my jaws again. “Soon you’ll be gone. Your days at McKinney’s are numbered.” He shoved me into the wall and walked away as though nothing had happened. I stumbled to the bathroom, trembling from head to toe, and splashed cold water on my face. My stomach churned. I had to get out of here. I didn’t want to face Rick. He must have confronted his daddy about the tongue-lashing Buford had given me this morning. That’s why Buford had grabbed me just now. Back at my desk, I scribbled a note to Monica that I was sick and needed to go home for the afternoon. I left it where she’d be sure to see it and then slipped out the back door. I made my way around to my car and climbed in. My hand shook so much, the key missed the ignition, but I finally cranked the engine and pulled out of McKinney’s parking lot. If I was smart, I’d never go back. Vickie, where can readers find you online? Where can readers purchase Wheels of Justice? Vickie, thanks for visiting with my readers and me. 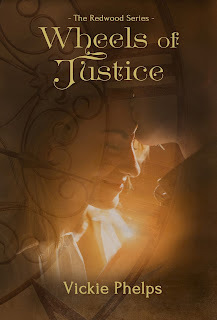 Vickie is offering winner’s choice of a paperback or eBook copy of Wheels of Justice to one commenter to this blog post. Commenters, to enter the book drawing please leave your comment on this post through September 5, 2017 and remember to leave your email address so I can contact you if you’re the winner. The winner of last Thursday’s blog post for a copy of The Fox of Cordovia by Linda Weaver Clarke is Connie. I’ll email you. Thanks all for commenting. Watch for more book giveaways. 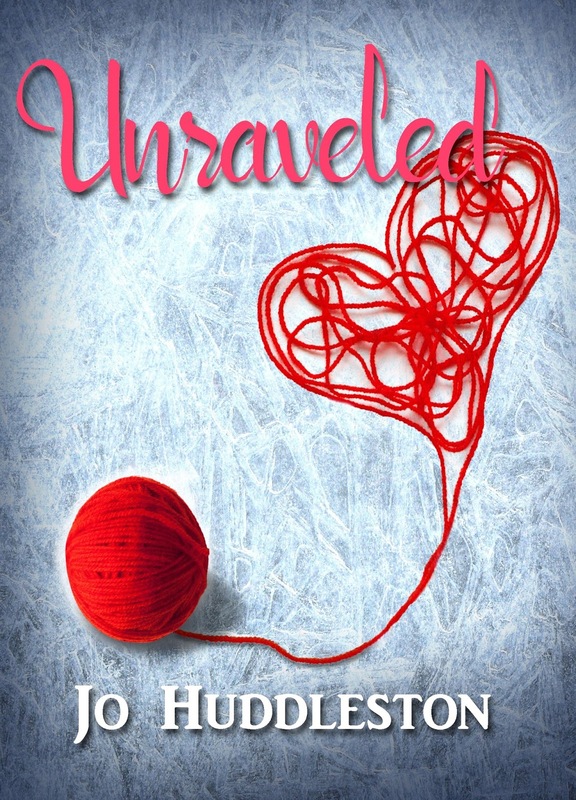 My latest book has released – Unraveled, a novella. Here is the cover, and you can read more about the book here. You can read the first chapter of the book on my website. This book sounds really interesting. I would love to win it! Debra, thanks for following my blog and for commenting. Ann, thanks for stopping by and leaving your comment. HI Debra, glad you visited the blog. Hope you get a chance to read Wheels of Justice. Oh wow! What a great excerpt! Sonnetta, glad you enjoyed the excerpt. Thanks for commenting. Sonnetta, glad you liked the excerpt. I really enjoyed writing this book. OH WOW! This sounds pretty good, I didn't think I'd like it but after reading this, I'm sold! Thank you for the chance to win a copy. Wendy, you're welcome. Thanks for following my blog and for leaving your comment! Hi Wendy, Thanks for your comment. I hope you get a chance to read "Wheels of Justice." Shelia, I appreciate you following my blog! Thanks for commenting. Sheila, thanks for taking the time to read and comment on the blog. I would love to read this book. Sounds great. I follow your blog too Jo. Donna, thanks for commenting and for following my blog! Donna, I hope you get a chance to read "Wheels of Justice." It's book 2 in The Redwood Series, but it can stand alone as a story. Thanks for commenting. Donna, I hope you get a chance to read "Wheels of Justice." Thanks for stopping by the blog. Paula, you're welcome. Thanks for leaving your comment. Paula, good luck in the giveaway. I love reading author interviews and finding out more about their books. Dianna, thanks for stopping by and leaving your comment. Hi Dianna, we authors love readers who want to find out about our books. Thank you for dropping by Jo's blog. Dianna, thank you for stopping by Jo's blog and reading about "Wheels of Justice. We authors like readers who are interested in new books. Right, Jo? Great interview! I am intrigued by this one! Melanie, thanks for coming by to comment. Melanie, glad you liked the interview and that you're intrigued by the book. Good luck in the giveaway. amandainpa, thanks for following my blog and for leaving your comment!